In order to impart the awareness of gender equality and equal opportunity to all students we have a very good women’s Cell named MANINI. Every year we are conducting different programmes relating to this Club. During 2012 onwards I had an opportunity to become the Women’s cell Co-ordinator. In 2012, we inaugurated our Cell activities on 3rd February 2013 and conducted a talk on Woman and Travel. Connected to this, we conducted a Elocution Competition in Malayalam. 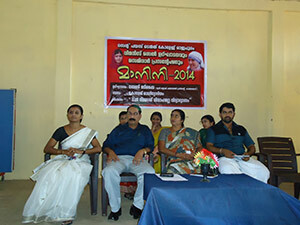 In 2013, we inaugurated our cell Activities under the Name MANINI-2014 on 22nd January 2014. Former Block Panchayat President, Kanhangad, inaugurated that function and made a talk on’ At the Age of Sixteen we Need Education, Not Marriage’. Moreover, we decided to conduct a Chalachithra Gana malsaram to offer remembrance of Sri. Raghavan Master and present one Gender awareness Documentory prepared by the Kerala State women Development Corporation, "Unarthpattu". Women's Cell conducted a Film Review competition on 16.3.2017 and the first prize goes to CS, second prize goes to Economics and third prize goes to Physics.